Smartphones and Tablets came along in our daily technology needs, but for some reasons, we need other gadget tools to keep ourselves updated. Some of these tools are already out in the local market, but for those who are looking for more convenient and alternative way to deal on storage devices such as micro SD cards, this be achieve by other tech products. As for example, if you got a memory card that needed to be read or copy to your Smartphone without removing its current memory card, there’s better way to handle that kind of needs. 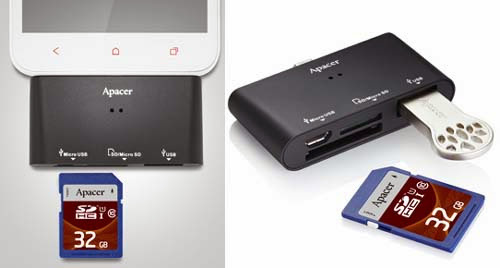 That’s why Apacer built the first multi-function card reader, the AM700, equipped with OTG (On-The-Go) technology. It can be directly connected to smartphones and tablet PCs for data sharing. Moreover, the scope of mobile applications is more extensive and has no limitation. The built-in USB slot of the AM700 further extends the application scope of mobile devices. In addition to connecting to flash drives and all-in-one card readers, it can even expand the storage space of smartphones and tablet PCs for data backup when inserting SD, MicroSD and MMC cards. 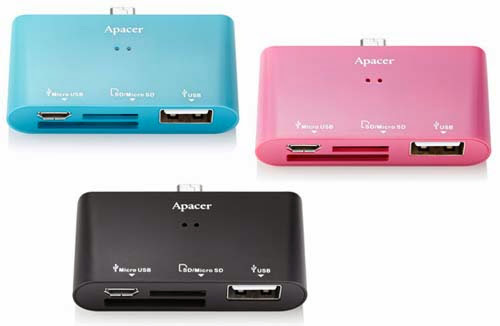 Multiparty data sharing is available by activating the USB Hub when connected to a power supply, such as the charger and the mobile power supply through the micro USB slot. The AM700 can also be connected to the hard disk, which is undoubtedly an excellent tool to improve the work efficiency for business personnel who focuses on mobility and timeliness. nice they already have this, i am sure i will buy this one. worth a money to spend for my media needs. it is hard to dismount and put another sd card into your sd card slot, good thing there is a otg card reader. i have this and its worth a bucks. apacer got all of innovation, but they still need to furnish their market.